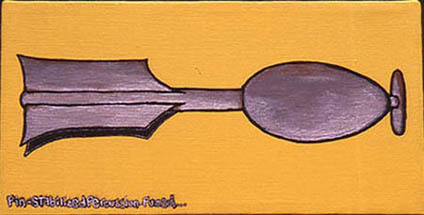 6X12", Acrylic on Canvas, June 2000. Another American Civil War grenade, this one was front-percussion fused, and fin-stabilized for throwing. Like a lawn-dart with enough explosives to blow holes in fortifications, concrete, wood logs, etc... Fairly widely used during sieges.